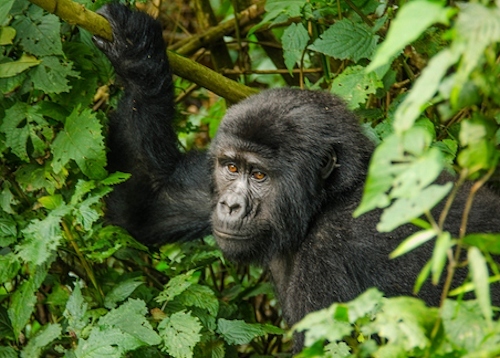 Rwanda, Uganda Gorillas in the Mist – The Great Canadian Travel Co.
Rwanda and Uganda – this fascinating tour combines these two neighbouring countries to create an experience offering a magical encounter with the majestic gorillas of Bwindi. Prices are shown in US$ and CA$, per person based on two people sharing a twin room. On arrival at Kigali you are met by tour guide and transferred the 12km from the airport to your centrally located hotel. The Park Inn by Radisson offers a prime city centre location and is the premier hotel choice in Rwanda’s capital city. Accommodation has been booked on half board basis, including breakfast and dinner. The 161 modern rooms and suites include amenities like free Wireless High-speed Internet and comfortable furnishings. Enjoy dining at Live Inn Room Restaurant, with its convenient dining hours. Amenities include a pool, pool bar and fitness centre. Easily reach government buildings such as the Presidential Palace and the Kigali Genocide Memorial Center. Breakfast at Park Inn, and then head out for a city tour of Kigali, including visiting the Kigali Genocide Memorial site, Kigali museum, and the Nyamirambo Women’s Center. Dinner and overnight at Park Inn. 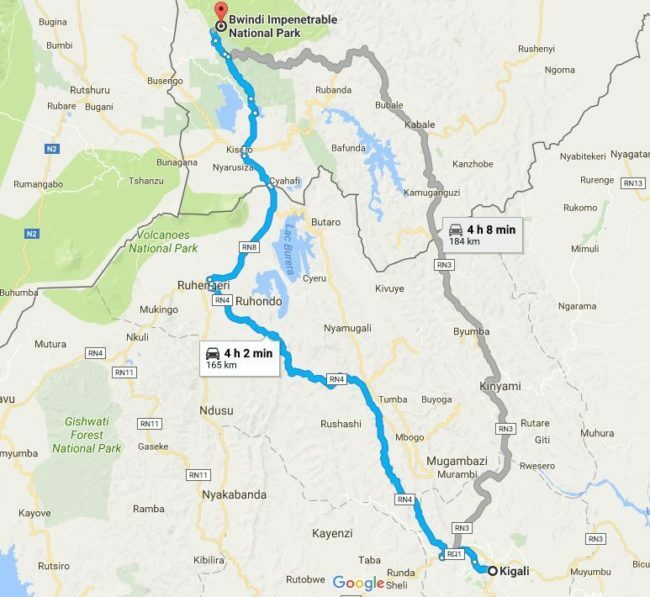 Breakfast at Park Inn, and transfer by road to Kisoro – Uganda (Bwindi national park area) via Cyanika Border. Drive to Bwindi Impenetrable National Park and proceed to Nkuringo Gorilla Lodge for dinner and overnight. Driving time today is 4-5 hours. 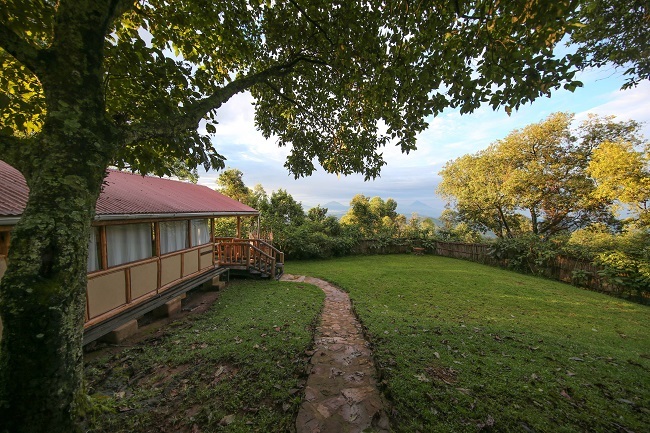 Sitting on the Nteko ridge, the eco-friendly Nkuringo Bwindi Gorilla Lodge overlooks Bwindi Impenetrable Forest, the Kashasha river valley, and the Nkuringo forested hill. The camp has views of the Virunga volcano chain and the Albertine Rift Valley and also provides prime access to gorilla tracking. Other activities include Buniga and Bwindi forest walks and bird watching, guided village tours, Batwa pygmy visits, and the Nteko ridge community trail. The proceeds of this trail go back to community support projects. 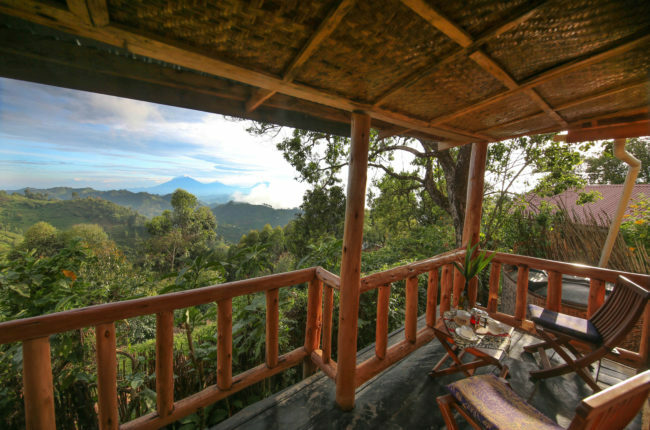 The lodge has 4 en-suite cottages, 6 en-suite Virunga Terrace rooms, and a family cottage. The smaller cottages and rooms have private terraces with beautiful views of the surrounding landscape and the family cottage looks out on to Bwindi Impenetrable Forest. There is a restaurant where guests can enjoy fresh and wholesome meals. Early morning breakfast at Nkuringo Gorilla Lodge, then a short drive takes you to the National Park offices by 8:00 AM for pre-Gorilla trekking briefing. Your guide will inform you regarding all the dos and don’ts while with mountain gorillas then you will be transferred to the starting point of your gorilla family trek. Please note that gorilla family allocation depends on your interests, fitness and age. 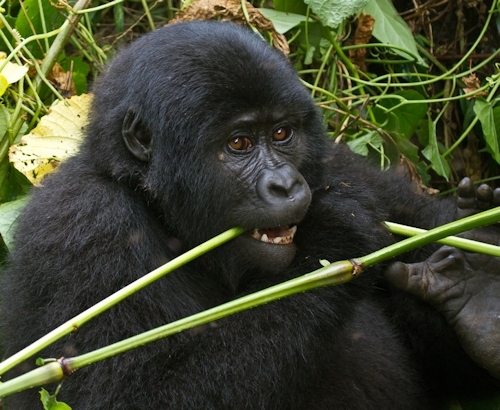 Gorilla trekking can be strenuous and a certain level of fitness is required. Trekking can take from 30 minutes to three quarters of the day so one needs to prepare for both. You guide will try to provide information about trees, birds and other wildlife in the forest until you reach a given family of gorillas. You will be allowed only one hour of photography and observing mountain gorillas as they go about with their daily day activities and then trek back to the park headquarters to receive your certificates. Lunch will either be a packed lunch or taken back at the lodge. Dinner and overnight at your Nkuringo Gorilla Lodge. Breakfast at Nkuringo Gorilla Lodge and then transfer back to Kigali, with a possible visit to Iby’Iwacu Cultural Village en route. Iby’Iwacu village is located around Parc National des Volcans in Nyabigoma, Kinigi, Musanze District, Northern Province Rwanda. Iby’Iwacu Cultural Village is committed to showcasing the ways of living, traditional lifestyles and dances to tourists. After breakfast transfer to the airport for your onward flight. This is the end of our tour. Extensions to other destinations are possible on request. For your Gorilla Trek: Make sure you have packed all the necessary trekking gear like gloves, trekking boots, long sleeved wear, rain jackets, snacks and packed lunch, walking stick (very necessary) and among others. 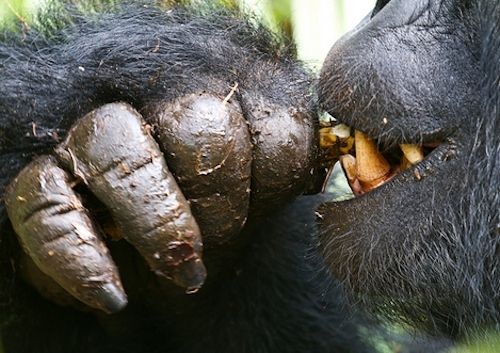 This is what you should expect the day of your gorilla trekking excursion in the Rwanda and Uganda. Carry your passport as you head to the park headquarters during the pre-tracking briefing by the officials. Your gorilla permits will be crosschecked with your passports to confirm whether you are the right owner of the permit. A cup of tea/ coffee will be served as you are being entertained by the local traditional Bakiga dancers to give you a good start to a strenuous, yet exciting day, before the ranger guide gives you tips on how to conduct yourself on this trek and ensure you are ready with your packed lunch. This is because there is uncertainty about the time you will take to see the elusive gorillas. After a quick briefing on safety measures and what to expect during the day, you will be grouped in groups of 8 people maximum and assigned one gorilla family to trek. Rwanda has 10 gorilla families / groups while Uganda has 12 gorilla families in the 4 tracking regions in Bwindi national park and 1 gorilla family (Nyakagezi group) in Mgahinga Gorilla National Park. Being wild animals in their natural habitat, seeing these gorillas so easily may not be guaranteed, as they tend to move as far as necessary in search of food. Even those which are allocated to the physically fit and energetic tourists, that are always regarded as strenuous to track, may be easily tracked on a particular day which makes gorilla tracking experience in Uganda both unpredictable and interesting. Each gorilla tracking group consists of a main guide and two scouts who carry AK-47 guns. One walking in front and another behind the group. The reason for armed scouts is for protection in the forest against wild elephants or angry wild gorillas. The scouts are trained to fire shots into the air first in order to scare away the animals. But this is only done on rarest occasions. when all other options like hiding away from the dangerous animals have been done. However, the policy of the National Parks is to be safe rather than sorry. The overall length of your hike to track the mountain gorillas will vary depending on how far the gorillas have moved. It may take as little time as 30 minutes to find your gorilla family and as long as five to seven hours. If you are unsure of your fitness, please let your guide know so that he may help you in hiring a porter at the park gate. A porter is hired at a fee between $15 to $20 depending on the weight of the luggage. The forest is verdant, humid and somewhat light and there are no discernible trekking paths. The terrain is full of hills and steep volcano slopes; where you will be required to pull yourself up steep grades by grasping onto branches, plant roots, bushes and more. Follow the lead of the guide as to the best path and form to take. You can have a short break during a long trek in order to relax and refresh. It is also advisable that you carry some energy giving snacks and bottled mineral water to quench your thirst and give you more energy in case of extensive gorilla treks.